Salty, sweet and dark, this Salted Honey Caramel has a twist! Fleur de sel brightens a flavor of honey and shimmers on the copper-color candy. Ease: Intermediate: Have all your measurements ready and at hand; making caramel requires attention to detail and timing. Appearance: A copper candy of mellow brown hue. Pros: A great at-home or away-from-home indulgent treat. Cons: Requires patience, attention and much clean-up! Would I make this again? Yes, it is decadently sweet and salty, making it a perfect treat all year round, especially during the holiday season. The balcony of my 11th district Parisian flat was delightfully nestled in the corner of the kitchen; it was my favorite of all spots to sit and enjoy the simple moments of life in the City. I loved returning to the flat after a long day of classes to find the pains aux pépites (chocolate chip bread buns) in the cupboard for an evening goûter snack. There were two bistro folding chairs on the patio and potted plants at the foot of each. Sometimes bees liked to make the most of their afternoons there in the summer heat amidst the beautiful blossoms. Like the famous line in the film Casablanca (1942), the story goes that the bees have always had Paris. The metropolitan-dwellers produce more full-flavored honey compared than their countryside mates, due to the diverse park, garden and balcony blooms.1 This sweet anecdote explains the best-kept secret to madeleines and nougat, for example (lavender honey from Provence is a classic choice). In the 3rd arrondissement, one district west of the 11th, Jacques Genin patisserie makes super soft, irresistible caramel candies that simply cannot be passed up. Now back in the States, with the Marais far from reach, I look to local Mesa, Arizona honey to stir up a pot of buttery honey caramel at home. 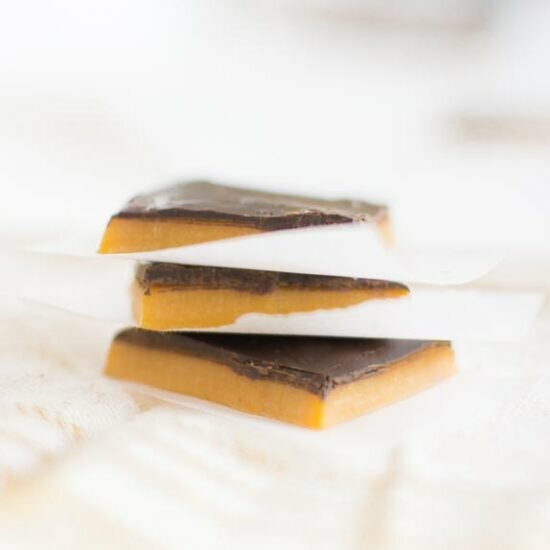 Salty, sweet and dark, these caramels have a twist! I combine a hint of my nostalgic balcony treat, dark chocolate, with the delicate crunch of a fleur de sel garnish. The sea salt brightens the flavor of the honey and shimmers on the copper-color candy. This fond recipe is an ode to summer afternoon daydreams, indulgences and moments of reflection in your favorite spot in the house. If you’re keen on spice, supplement 1 teaspoon of cinnamon and ¼ teaspoon ground ginger for the chocolate. Trace around an 8×8 baking pan with parchment paper, leaving about an inch on all sides. Generously butter the parchment paper and place it as securely as possible inside the pan. In a small saucepan, heat the condensed milk, butter, honey and cinnamon. Keep an eye on this mixture: once the butter has melted, turn off the heat. At the same time, insert your kitchen thermometer (optional) into a medium saucepan, combine sugar with 2 1/2 tablespoons of water. Place over medium-high heat and let the sugar dissolve. Stir gently to be sure that the sugar melts smoothly. From this point on, stir only as necessary. Cook until the sugar reaches 300 degrees, or for 5-7 minutes. Remove from heat and add the cinnamony milk and butter to the sugar mixture. Cook the caramel over medium heat until it reaches 245 degrees, or for 3-5 minutes. Remove the medium saucepan from the heat. Add vanilla extract. Pour the mixture into the prepared baking pan, carefully as to not scrape the hard bits on the bottom and sides. While letting the caramel cool for up to 15 minutes, melt chocolate chips over low heat. Spread the chocolate over cooled caramel. Sprinkle fleur de sel as a garnish. Once completely cool, lift out of the pan and onto a countertop. Slice the bar of caramel with a long, sharp knife. Diamond Troutman was first introduced to the art of French cooking at age 11, when play dates with a friend turned into casual lessons of language and culture with her Parisian mother. These sweet lessons of joie de vivre inspired the ultimate wanderlust and a move to The City of Light, where she launched a food and travel blog called Paris Elsewhere. Today, Diamond is a Phoenix-based Content Producer for lifestyle brands, restaurants and magazines. When she’s not styling food for work, her go-to recipe at home is the classic sablé cookie.